Golden-brown color, rich in flavor: made of cranberries, hazelnuts, agave syrup.. they are not heavy at all. The banana in this biscuits give them moist and keeps them light. I bake them each Christmas. 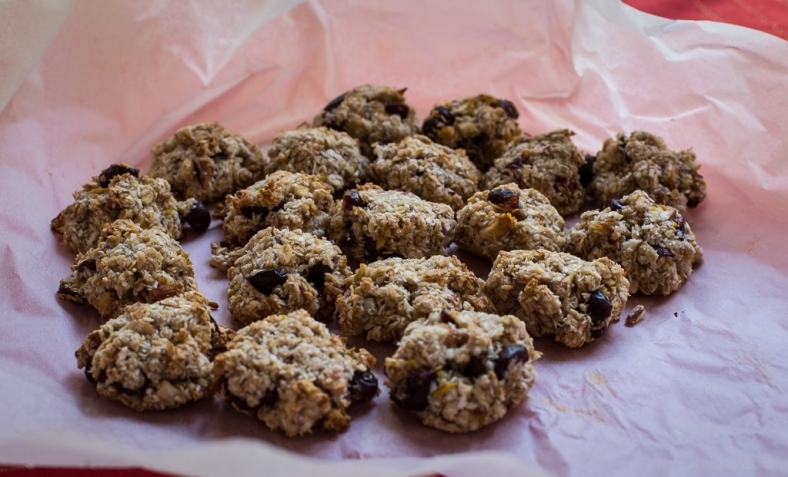 My friend Elda send me this recipe with a note: “Biscuits for perfect breakfast!”, but I can eat them anytime. Elda has many delicious yet simple recipes that I am always asking for and she is very happy to pass along. She is very practical and creative person, so the recipe is simple and finally biscuits are awesome, crunchy and sticky. In a food processor mix together banana, coconut oil, agave syrup . Than add all other ingredients and mix it again. Shape the biscuits with teaspoon. Prepare rectangular baking pan, cover it with baking paper. Bake it 20 minutes, in the preheated oven on heat 180”C.